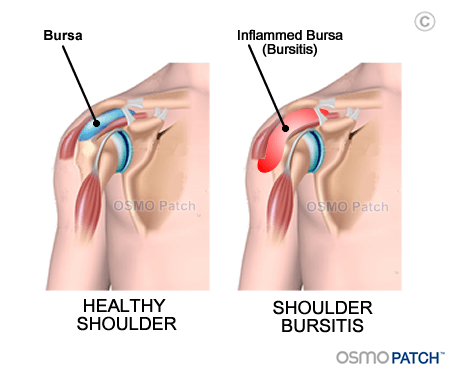 Bursitis shoulder pain will sometimes be called a rotator cuff injury however this is a general term that also includes shoulder tendonitis pain. Shoulder bursitis pain should not be left untreated as it may become chronic which could then lead to scar tissue formation and further irritation and shoulder pain. Even shoulder pain at rest. Shoulder bursitis can be felt as either right shoulder pain or left shoulder pain. As more people are right handed than left it is not unusual to expect right shoulder pain to be more prevalent than left shoulder pain. How is Shoulder Bursitis diagnosed? Bursitis in the shoulder is not normally associated with visual swelling so it can be hard to properly diagnose on visual examination. A proper diagnosis from a qualified health care professional is important to rule out other causes of shoulder pain and hence an ultra sound and X-ray will be required. In some cases an MRI may also be required to rule out any co-exist conditions that may have contributed to the condition. Are there any exercises for shoulder bursitis that I should or shouldn’t be doing? Should I be applying ice or heat for shoulder bursitis pain? What are the Current treatment options for shoulder bursitis? Are there any Natural Treatments for shoulder bursitis?